AUVs belong to the often generalised category of UUVs – Unmanned Underwater Vehicles. 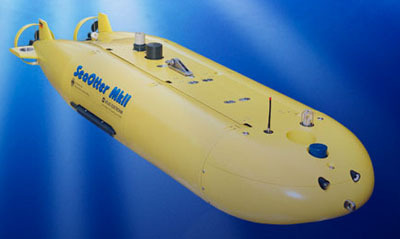 This UUV categorisation also includes vehicles towed by surface craft and vehicles connected to a mother platform by means of an umbilical cable the so called ROVs (Remotely Operated Vehicles). Both the towed body and the ROV require a mother platform to be closely attendant in the vicinity, while Autonomous Underwater Vehicles are unmanned, self-powered vehicles with no cable connection to the surface. AUVs are able to operate completely independent from a surface platform with minimum technical or logistic support and no externally applied signals or tracking systems required. They can operate at variable depths for lengthy periods of time, including operation in areas which are inaccessible to towed bodies or ROVs be it because of geographic constraints or because of the necessity to operate covertly. Because of these unique capabilities, AUVs are a highly valuable asset in the underwater battlespace.